Parents become responsible for the loans when children die unexpectedly. Lenders call parents every other day for payments. Sometimes, parents become co-signers on the student loans without any fault. Parents become responsible for the loans when children die unexpectedly. Lenders call parents every other day for payments. Financially affluent parents can get rid of those disturbing calls by paying off the loans. It is the middle-class parents who suffer emotionally and financially. Every call reminds them of what they have lost. However, they don't get any respite from the calls till the loans are paid off. Personal finance experts have warned all the people for not becoming a co-signer on any one's loans. In spite of the warnings, people continue to co-sign on the loans. People do this for their children, spouse, relatives, friends, family members, etc. Although, not all the co-signed agreements end in a disaster, but many do in this present economic situation. If your sibling, friend, relative or any one else has asked to become a co-signer on a loan, then it is better to take some preventive steps from beforehand. This will help you safeguard yourself from financial problems in future. 1. Ask a few relevant questions: Lenders ask some important questions before lending money to borrowers. Likewise, you can ask the borrower about his current employment status and budget to know if he/she can make the payments easily. Other than that, you can even check his/her credit report to know if he/she is a responsible borrower. The financial health of the borrower will help you understand if it is feasible to co-sign on the loan. 2. Find out what you're getting into: Check out the terms and conditions of the agreement to know what you're getting into. Find out what will happen if the borrower is unable to pay off the loan. It'll help you understand the importance of making timely payments on the loan. Make a special note of the payment date. 3. Review your estate plan: Contact your financial planner and review your estate plan before co-sign on a loan. Remember, if the primary account holder is unable to make payments, then the lender may come after your property and assets also. So, analyze your real estate plan and find out if your assets are secured. If not, discuss with your financial planner about the ways to protect your assets from creditors in future. Anything can happen in future. Its better to stay protected rather than losing your asset. 4. Ask for a collateral to seal the deal: A lender would demand for a collateral if the borrower has made too many financial blunders in the past. You too can ask for extra pair of keys of the borrower's vehicle. If the borrowers default on the loan, then you can at least take the possession of the car and sell it. You can use the sale proceeds to pay off the debt easily. 5. Keep a tab on the progress carefully: Have a talk with the primary account holder at least once in a few months about the payments. You need to know if the primary account holder is making regular payments to avoid problems in future. However, be very subtle when you ask questions about payments. Don't call the person every other day. This will create a rift between you and the other person. 6. Purchase a life insurance policy: Well, if the debt amount is very huge, then you can purchase a life insurance policy on the primary account holder. Usually, you wouldn't prefer to think about this if you've co-signed on a loan for your loved one. However, unfortunate events do happen in life. Ask your self if you would be able to repay the loan if the primary account holder passes away. Remember, once the primary account holder passes away, you'll be held responsible for the debt. A life insurance policy will safeguard you in such instances. Co-signing is an important financial decision. 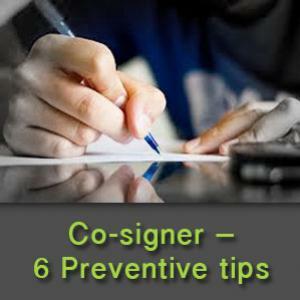 So, become a co-signer on a loan only after taking preventive steps. It is completely useless to shout at the lender when your credit score drops because of irregular payments on the loan. As soon as you sign a contract, you become fully responsible for the loan.